Over the last year the European Space Agency’s (ESA) Trace Gas Orbiter (TGO) spacecraft followed the onset of the storm and monitored how the increase in dust affected the water vapour in the atmosphere – important for understanding the history of water on Mars. It did not observe the presence of methane, further adding to the mystery of why other missions like the NASA Curiosity rover reported localised concentrations, which could indicate life. ExoMars is a two-part mission. The Trace Gas Orbiter will be joined by the UK-built Rosalind Franklin rover, which will roam the surface of the planet in 2021. ExoMars embodies the best of UK and European space science and I’m delighted that Britain is one of the biggest supporters. This data release is the first of many on our mission to unearth the mysteries of the Red Planet. The results both answer, and raise new questions, paving the way for more exciting discoveries from the Rosalind Franklin rover which is due to launch next year. The UK Space Agency has invested €287 million to the overall ExoMars mission and €14 million to the instruments over 13 years, making it the second largest European contributor after Italy. A further £370,000 has been committed on the spacecraft’s instrument operations and over £2.5 million on data analysis. The UK space industry provided the spacecraft’s batteries, ultra-high frequency (UHF) transceiver and aerodynamic analysis. Dr Manish Patel at the Open University led the UK design input for the spectrometer system which will look at atmospheric composition and is playing a key role in the instrument operations and data analysis. The UK Space Agency is also supporting 18 researchers in 5 British institutions to analyse data received on the Martian atmosphere. The measurements we have made are very surprising. The methane previously detected by ground-based telescopes, the ESA Mars Express spacecraft and the NASA Curiosity rover seems to have disappeared. Mars continues to confound us – the only way these results make sense with previous observations is if there is a new mechanism in the atmosphere, removing the methane at a rate far faster than thought possible. As always, Mars provides us with another mystery to solve. 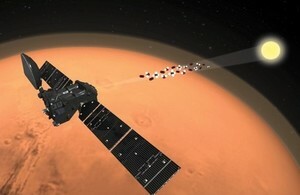 ESA’s Trace Gas Orbiter is studying Martian atmospheric trace gases and their sources in unprecedented detail. It will help us understand the source of the methane in Mars’ atmosphere and whether it is from a geological or biological source and provide a data connection to the Rosalind Franklin rover, currently under construction by Airbus in Stevenage, Hertfordshire. The Trace Gas Orbiter arrived in orbit 400 km above the Red Planet in April 2018, just a couple of months before the start of the massive dust storm that would eventually lead to the demise of NASA’s Opportunity rover after 15 years roving the Martian surface. The ExoMars rover was named after UK scientist and co-discoverer of the structure of DNA Rosalind Franklin in February 2018, following a competition to which almost 36,000 people responded. The Trace Gas Orbiter results were presented this morning at a press conference for the European Geosciences Union (EGU) general assembly in Vienna. For more information visit the ESA robotic exploration of Mars website.